Gates is going to be fine… Trust me. Ok, don’t take my word for it, be that way. 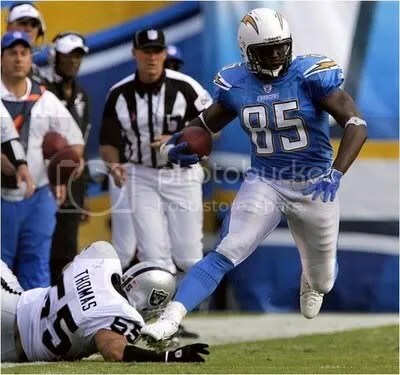 But if you are a believer, rest assured knowing that Antonio Gates practiced fully this week for the Chargers. He will carry the caution flag all year till he proves he can stay healthy but it will take a serious injury to knock him out of the game. As we’ve seen in recent years, he can play games hurt multiple weeks in a row. His name will just have that unbearable red ‘Q’ next to it. Call me crazy but I took him as the number one TE off the board in an 18 team league. BUT, this league doesn’t play a normal playoff system. We have a 17 week regular season and the NFL playoffs are our leagues playoff with a redraft. So I’m really just hoping for about 12 games out of Gates. I wouldn’t draft him #1 in standard leagues, but him practicing is a good sign of things to come. Awesome updates, FFJ! Gates (foot) was able to work fully all week, and there appears little doubt he will be close to 100% for the season opener, the San Diego Union-Tribune reports. Thanks John, appreciate the sharing! Hey John, would love to review your book for ya. Appreciate the sharing and tweeting of my site!